Learn how to enter a deposit paid to a supplier or a credit that you've received from a Supplier. Why record deposits and credits in a special way? When you pay a deposit to a supplier or receive a credit from one, it's an asset, not an expense. 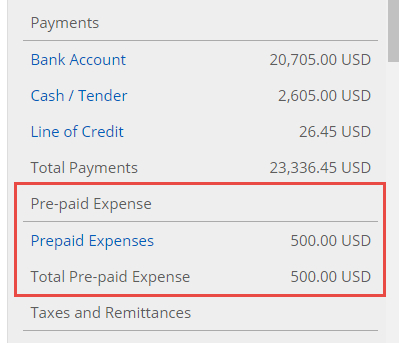 To account for the credits you have with a supplier, you temporarily place the money into the PrePaid Expense account. To then use the credits, you apply them against a bill, which moves the money from your Prepaid Expense account (an asset) into your expense account. 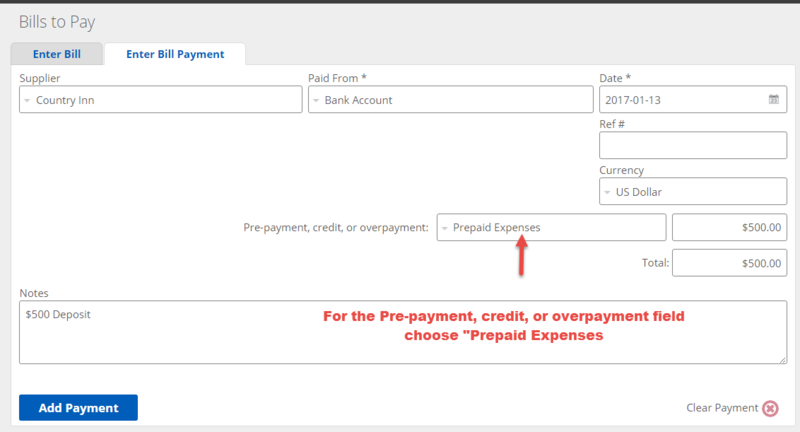 If you have removed your PrePaid Expenses account (by default, your chart of accounts will have this account), then you can add it back by going to the Accounts page. Here's some additional information about creating the account. Description: A description isn't necessary, but you can add a description like "Expenses paid in advance or credits for supplier bills". Type: Make sure to choose the Pre-Paid Expense account type instead of a regular asset account, since this account type has special properties that allows you to apply funds within it as payments for bills. 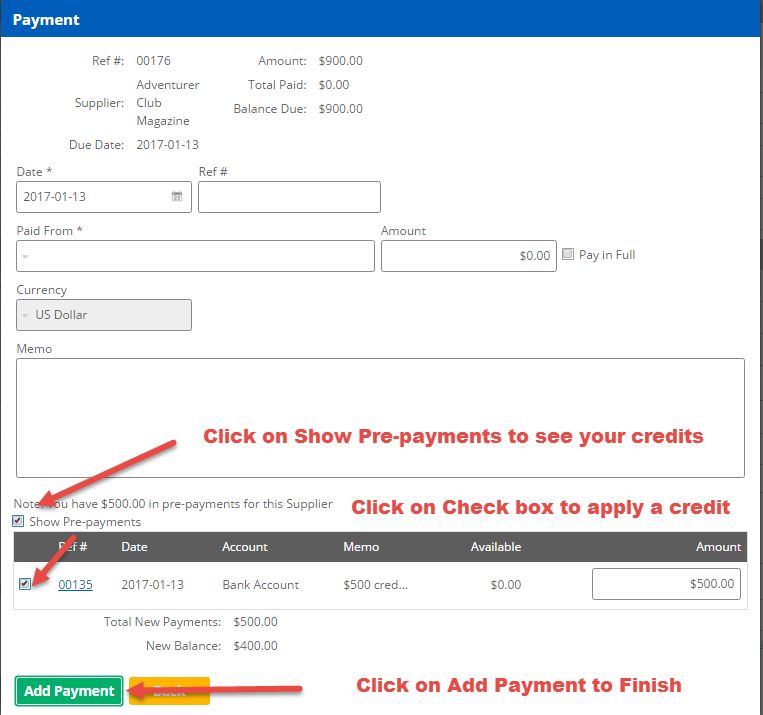 Here's an example of how to record an advance payment you made with a supplier. First, go to the Bills to Pay page. Then go the Enter Bill Payment tab. 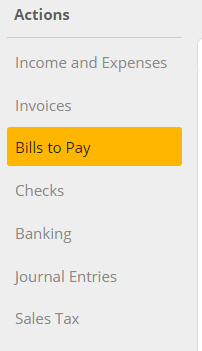 You fill out the fields like you would for a bill payment, so for the Paid From, you choose the account you used to pay. However, instead of selecting a bill to pay, for the Pre-payment, credit, or overpayment field, choose the Prepaid Expenses account and enter the payment amount. In the above example, a $500 payment was deposited into the Bank Account. Alternatively, if you overpaid a supplier bill, select the bill that has been overpaid. Additionally for the Pre-payment, credit, or overpayment field, choose the Prepaid Expenses account and enter the overpayment amount. Entering a credit is also very similar to entering a deposit. The difference is that you would use an Expense Account for the Paid From. For example, if the bill that you're being issued a credit for used the Advertising & Marketing Expense account for the Expense account, then that's the account you would enter into the Paid From field. If you are in a country that has Value Added Taxes (like VAT, GST, or HST) and you recorded those taxes on your bill, you need to make sure that you create an additional credit for the tax portion of the credit. So, if the sales taxes charged was 5%, you'd enter an additional credit for $25.00 that credits the State Tax Receivable account. Note: The name of your Sales Tax Receivable account will probably be different, since the account will start with whatever your tax name is called. So, if the name of your sales tax were called "VAT", then your account would be named VAT Receivable. 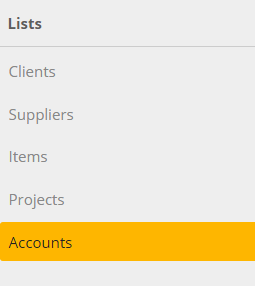 To see the deposits/credits that you have with a supplier, go to the Suppliers page and choose the supplier. 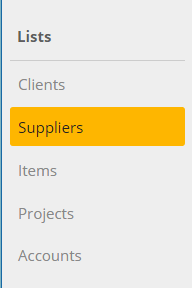 On the right hand side of the supplier's profile, you will be able to view the balances, which includes a section called Pre-paid Expense. Applying funds found in the Prepaid Expenses account to a bill is easy. All you need to do is go to the Bills to Pay page and click on an existing bill. Then click on the button Add Payment button. Note: If you need to print a check for the bill, apply the credit before going to the Checks page, and the bills to be paid will reflect the applied credits. If you want the supplier to know why you are paying them less than the amount of the invoice you can write a memo on the check.